On Sunday we were out early to make best use of the relatively bright sky and a distinct lack of people. Almost immediately we found a Purple Sandpiper perched halfway down the sea wall in what turned out to be quite a precarious position. I didn't even have chance to focus the camera before a large wave rolled in and very nearly engulfed the tiny bird. It only just escaped with the breaker nipping at its feet all the way to a slightly safer perch near the pier. 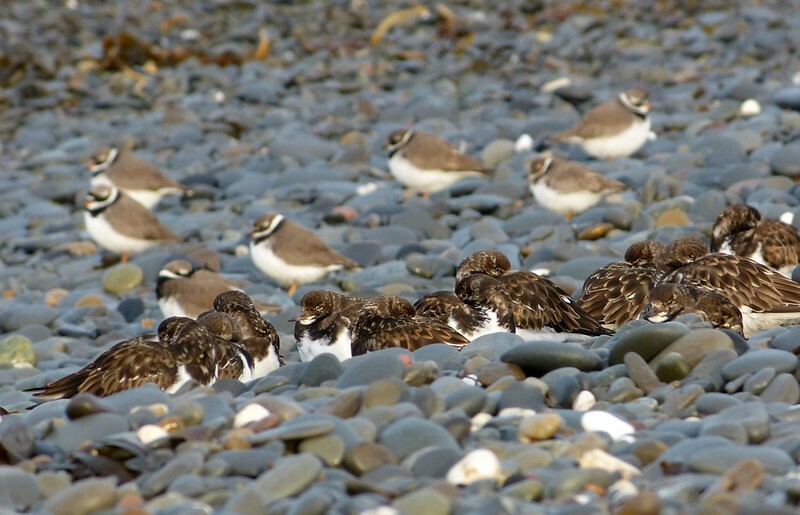 A little further on and it was a flock of roosting Turnstones that caught our attention with several Ringed Plovers sat behind. Regular readers will know that I can never pass a Turnstone without at least trying for a photograph, and the group duly obliged. I could have probably got even closer to try for a couple of portrait shots but a large wave soon put paid to that. With the roost site engulfed and my left foot considerably wetter it was time to move on. Progress along the beach was more difficult than usual due to the heavy frost having stuck every rock and pebble together. The effect was something akin to walking on an uneven surface that would randomly give way with no warning. 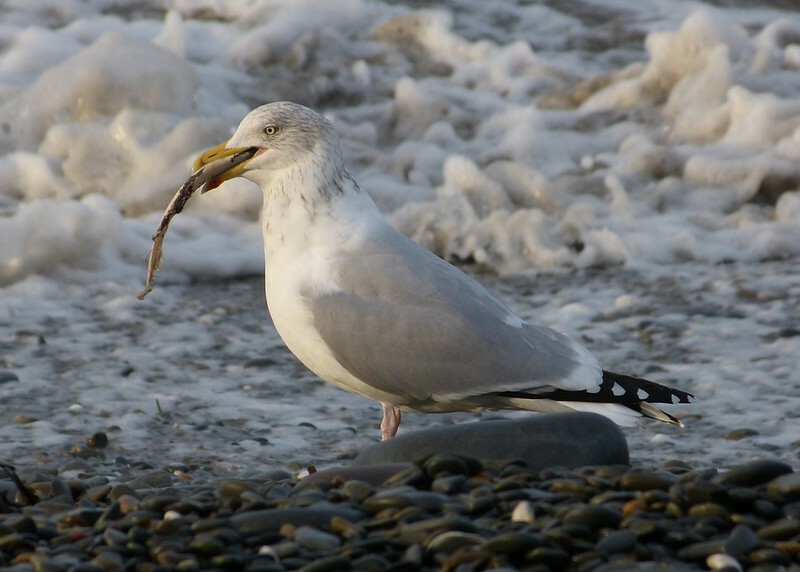 I'm sure the gulls were laughing, perhaps with the exception of this Herring Gull which had managed to find itself a dead fish along the shoreline. 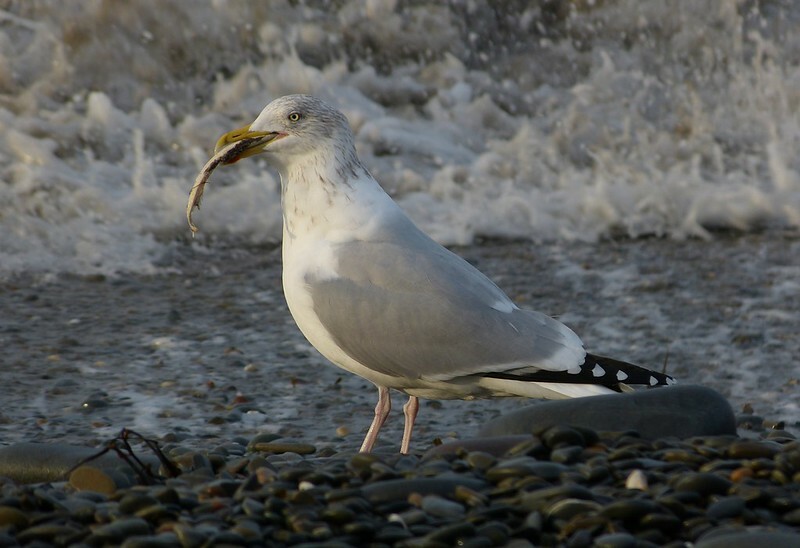 I've no idea what species it was and didn't have much chance to speculate before the whole lot had disappeared down the gulls throat. I had expected it to pick bits off but apparently good etiquette was not on the cards. 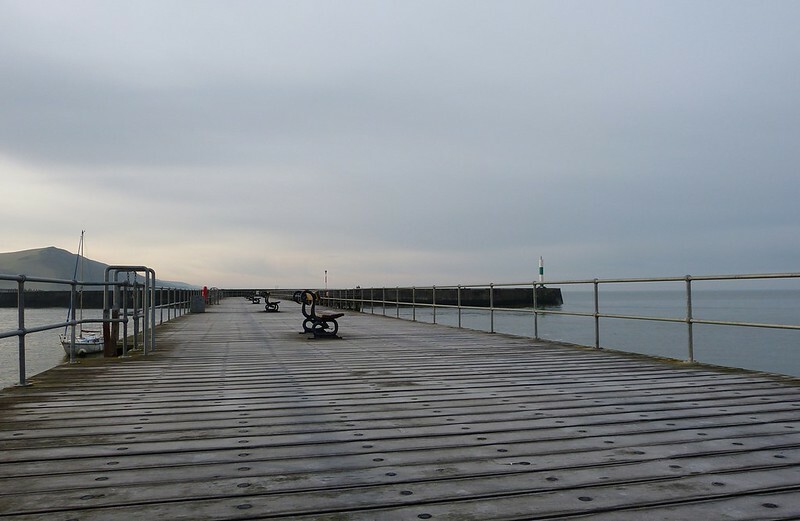 Down in the harbour and frost was again sitting heavily on the wooden pier. A couple of Meadow Pipits and umpteen Feral Pigeons were making their presence heard while we had a scan through the gathered birds. With the sea much higher than on Saturday there was less around so no Common Gull, though it was nice to watch a Cormorant fishing for its breakfast. 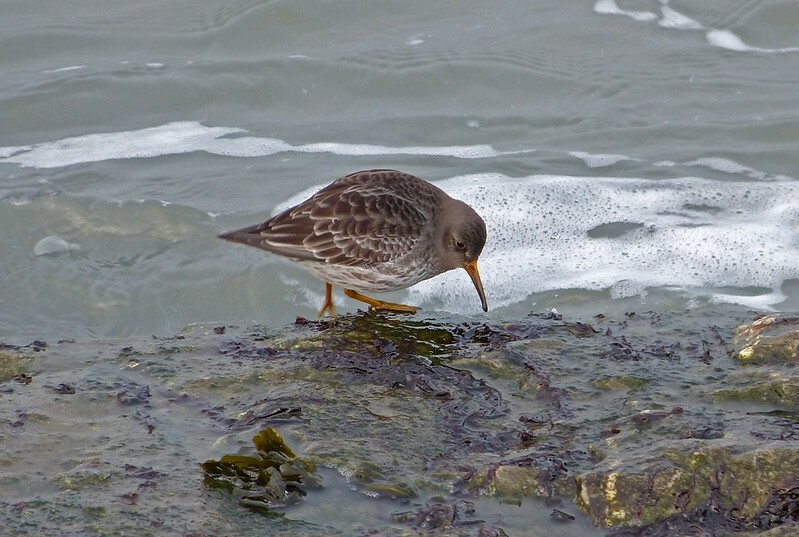 The real stars were to be found on the seaward defences where at least six Purple Sandpipers were dodging breaking waves in their hunt for food. Light levels were very low and the birds very fast so I really struggled to capture them on camera. Fortunately I managed to get a single shot that came out sharp without too much movement on behalf of the Sandpiper. Before heading for home we had a wander along Tan-y-Bwlch in the hope of spotting a wayward Bunting or perhaps a Diver species. There was to be no success on that front but I could hardly complain after such a fantastic weekends birding. There was however to be one final surprise in the shape of a Lamb that couldn't have been than a couple of days old. It's incredibly early in the year to see one and blows my previous record out of the water. I hope it makes it through till Spring. 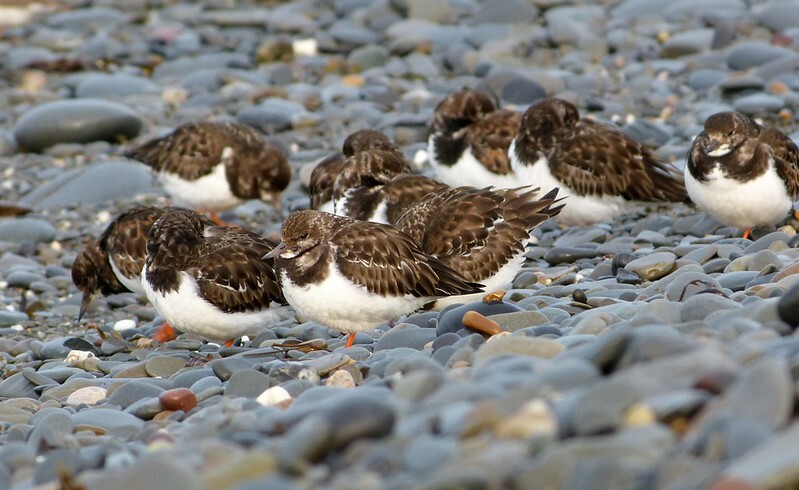 Really great the Turnstones and the Purple Sandpiper, the last of those two I have never seen one. The turnstones are an awesome bird to watch, your photos are great of them, and the gull with the fish another really great shot, I have never seen the purple sandpiper so thats a thrill for me! 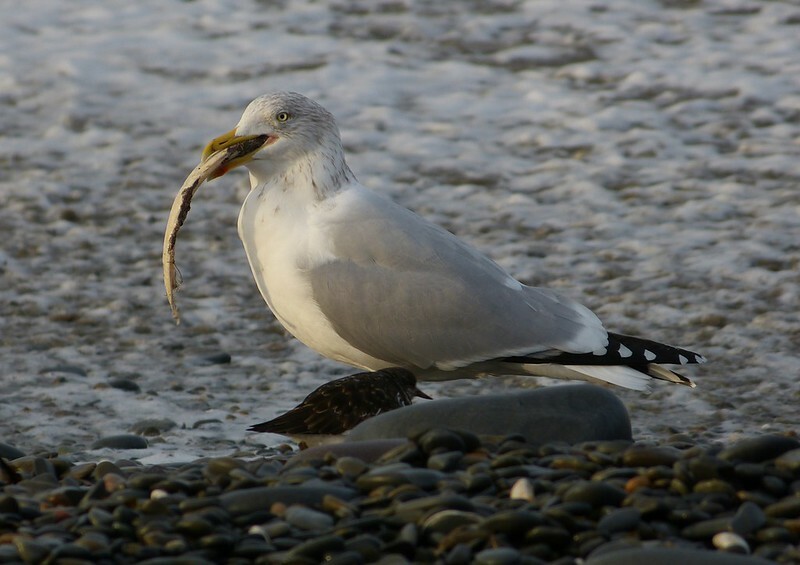 Quite a mouthful that gull had. Beautiful photos and such an amazing place to have a holiday. I'll be looking for aberystwyth self catering accommodation of where I would be staying.